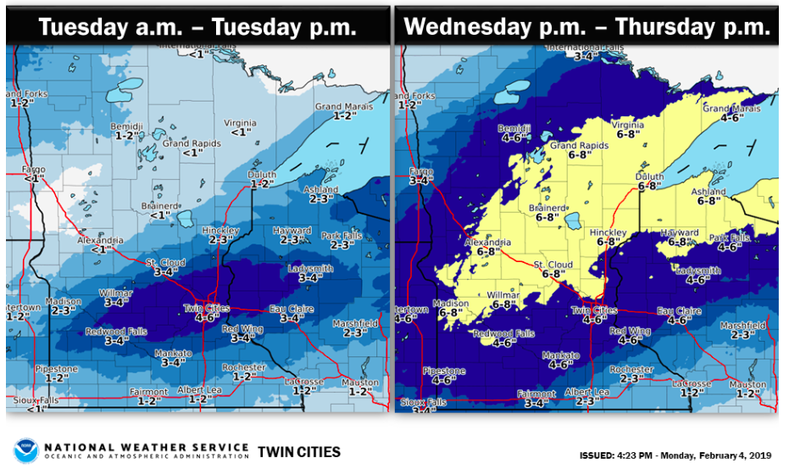 The Minnesota Forecaster: A Snowy Week in February? Yay. New thread. NWS is still holding with 2-4 inches today metro and 3-7 spread Wed night through Thursday metro area. Time will tell. Anything beats an ice rink. Dance, PWL, dance! I'd again suggest he doesn't dance as in the past such dancing has actually reversed snow accumulations. Don't ask me why but just an observation throughout the years. So sit PWL, sit. Appears my assessment was true. Still holding? It was 4-6” a mere 12 hours ago. Already snowing just west of the metro! Heard on ch4 and ch5 this morning that it wasn't supposed to be hitting the ground until closer to lunchtime today. Whatever you are doing right now PWL, keep it up man! Looking at the latest HRRR 13Z the heaviest snow is just south of the core 30 miles or so. From Mankato running northeast into Goodhue/Wabasha. West Metro = 2/3 inches, core 3, east metro 4/5, north metro 2-3, south metro 3/4 inches. The latest NAM and other convection models put the heaviest over 6+ inches from Mankato through or just north of Rochester up to Red Wing then through central Wisconsin. South West subs looks like it would get maybe an inch while then north subs might get 5. Ouch core metro! Do not look at the latest HRRR model runs. This is such an interesting 4cast today (TUE). There is NO obvious surface low to speak of. It appears that most of the lift/forcing is in low/middle layers of our atmosphere from about 850mb on up to 500mb. In other words, this isn't your 'classic' snowstorm. However, the support up top is pretty darn good given the circumstances. What does this all mean? Surprises. There will likely be a couple of narrow but impressive bands of snow across southern MN/Wisconsin. For instance, gut feeling is that one of these bands sits over the central & northern MSP metro today. This will produce 4"-6"+ of snow while the southern metro receives little. I'm also worried that a 2nd band of snow will explode over southeastern MN near or just east of RST. This would be convective in nature (1"+/hour) as it rolls east into WI. This will surprise those down there. Thanks for your thoughts Tom! Boy winter has sure gotten interesting around here lately. "Since the snow hasn`t yet developed, believe this is an issue for the hi-res guidance, so continued the course with the global guidance." In other words, the short term Hi-Res guidances (HRRR, RUC, etc) utilize radar data & surface obs in their solutions. The weigh heavily on this data, especially when compared to the GFS, ECMWF, NAM, etc. Now that precipitation is developing, the HRRR, RUC, etc. should latch onto a better solution in upcoming runs. Updated forecast down to 1-2 inches for the core. As usual... it snows everywhere else than in the Metro core. Expect the same to happen tomorrow and Thursday. As Boring Anonymous said: we can't win this season. Where are you getting your info. from? Makes no sense at all. You're wrong, it doesn't snow in St. Cloud anymore either. Too far north for the systems that come from the south and too far south for the Northern systems. It sure seems that way anyways. I agree w/ Novak...makes no sense. 2" has already fallen just west of the core (approx 15 miles west of downtown Mpls), and there's multiple bands of snow still poised to march through according to radar. I think Anonymous should just look out the window every once in a while to get weather information! I already have 2 1/2 inches here in Central Bloomington. NOt sure why the NWS downgraded their totals. It's beautiful to watch not so fun to drive in. Stay safe and keep dancing! Boy, gone are the days of 2010 - 2015ish when we had some good ol' weather discussions on this board. It was full of great insights from Tom, and other contributors that used DATA to support their thinking. I wonder why most of them are either gone or contribute few and far between? Who the heck wants to deal with internet tough guys. I comment once in a blue moon and mostly here for the different forecasts, opinions, and grades but it sure has gone down hill with all the anonymity, trolling and just overall nastiness. Just my opinion, carry on. Right on! I try to look past that and focus on the old-timers, the ones who explore/discuss the weather in detail, and the 'grades' for how the other meteorologists do on the local news outlets, etc. Today's snow is beautiful, light, fluffy, easy to shovel so far...... I am happy for all the snow lovers out there. Oh, and Novak Weather seems to focus more on his FB page plus has a website that seems 'new'... so these methods of communication may be taking up more of his time. It's good to see him on here, too. Onward as we finish up snow event #1 and head for snow event #2 tomorrow/Thursday! It will be interesting when snow totals come in. They will be all over the board. Best guess is 3"-5" in the core metro. 5"-8"+ just south of the metro. Sharp cut-off northwest of the metro from STC on north. Meanwhile, with all the haphazard snow bursts & banding, you are going to get varying totals just within 10 to 20 miles of each other. Truthfully a fun & challenging snow system to 4cast. This is crazy. I just took a glance at the Hwy. 52 camera near Cannon Falls & they have near ZERO visibility with heavy snow. 2" per hour? The stretch from Faribault to Red Wing to Eau Claire will have some impressive totals when all is said and done. Absolute chaos here in Red Wing. Many roads are undriveable; main stretch of highway through town was littered with crashes and going at a standstill on my way home from work. Half a foot on the ground and still coming down. I wouldn't advise anybody driving if they can help it tonight around here. Short notice, but I'll be doing a video with Dr. Novak at 7. Submit any questions ASAP. Thanks for the video! I was surprised earlier to see big and fast flakes in very cold temps. Thanks for explaining it all. I still want to know what was in the oven though. Same here in Rochester. Roads are a mess and now that the snow is done it's been drizzling and making windshields and other objects a little icy. In looking at the models, I see most showing 12+ for this storm on Wednesday night/Thursday. Am I making things up? And, looking ahead, I am seeing another 12+ after early next week. I mean I can hardly take this. Wetting my pants. I was repeatedly assured by those on this site that it never snows in the Twin Cities. Reading some of the previous post's, it's interesting that some have wondered where the more detailed discussion have went to. I was one of those that posted those discussions, however this year the storms have come at such a time where I haven't had a couple days off in row prior to the start of the storms to view detailed weather maps. I have to take care of priorities on a day to day basis. However the raw snowfall maps have been showing this kind of results for the last few days. Current plans are for me to retire this summer and play some golf. After that I once again will have time to dig deep into winter storms. Who knows I may even upgrade my monitor to include a camera....oh my did I just say that?? Could it be that Minnesota Forecaster readers could get a chance to see my ugly mug? That last paragraph is directed more to Big Daddy than anyone else. Yes!.... @randyinchamplin, can't wait! Bill make sure you hit up Randy for some videos next winter. I for one have missed your commentary on here Randy especially when your broke down expected snowfall in the core metro into 4 quadrants centered around 394/94/494. Don't forget about 694 it helps me delineate the NW metro and the NE metro. 3:20 a.m. still hanging with WWA. Strange, considering all the totals, wind, freezing drizzle, and falling temps/windchills they are putting out. I agree with you, randyinchamplin. Does anyone know the snow ratio (is the term "QPF"?) for tonight's system? I saw the GFS is laying down .33" of liquid but wondering what the ratio would be with the cooler temps. Looks like the whole state is essentially in a winter weather advisory. You all are talking 12 inches and WSW, but NWS is sticking to 3-6. Why the drastic difference? They going by past precedent of storms underperforming this season? Yes I was wondering the same thing. Reading the advisory text for southeast Minnesota it says maybe 2 10th of an inch of ice and then 2-4 inches of snow. Tom N has 6-9. If we get 0.2 inches of ice, we need to be in a warning. Monday was treacherous enough without snow on top. afternoon." Looking at the NAM and GFS I don't see where Tom could be getting these higher amounts. Hopefully he chimes in. Usually when there is ice or mix it always majorly impacts snow totals. Wildcard is this evening. My 6"-9" totals assumes that we get 1"-2" by midnight. If not, then we need to scale back a touch to 5"-7" or so. Regardless of what happens this evening, I simply can't imagine that this powerful of storm will NOT drop at least 6" or so of snow across eastern MN & northern WI. We will likely experience snow rates at 1/2" to 1" per hour between the times of 6am - 6pm. That is around a 12 hour period of snow at those rates = 5"-7"+. For the record my posts are from someone in Rochester. "but MSP has been snake bitten all season so....."
You're effin kidding me . . .
My 20-minute commute yesterday was 1hr 5min. WTF, snake-bitten? Eastern part of the metro has been upgraded to a winter storm warning! Lining up with Novak's prediction. Enjoyed the video last night and watching how things are coming together today. No matter the totals, tomorrow looks brutal for travel in the metro. Hope Novak keeps posting here, enjoy his take versus the NWS. Damn, just saw lightning at the MN/IA border on radar. Lots of energy. Snowstorms always bring surprises but they are rarely centered in the metro core in a good way(if you know what I mean > snow). I hate to use the word bust , but I can’t find a better word to describe how I feel about tonight and tomorrow in the metro. NWS doesn’t seem to have a good handle on things been moving around with snow totals constantly. Went with a watch out west to an advisory to now a blizzard warning and then a advisory to a warning to our east and if you have noticed now not much to occur tonight and main show suppose to arrive now not till mid morning it just seems they keep pushing it back. I don’t have a good feeling they are being consistent, so I go back to my original statement that their maybe surprises in play here and metro doesn’t get much. As people say before something “smells”. We wait and see! Just channel surfed for predicted snow totals in the metro tonight/tomorrow: Dave Dahl: 3-4 inches tonight; 3-4 again tomorrow. Belinda J: only 3 inches total; Same on Channel 4: (Matt Brickman??) 1-3 inches unless there is a shift, but he saw heavy snow 'moving more towards the east' and then Ian L on Channel 9: 3-6 inches. So Dahl is buying the Novak theory. I like him since he isn’t afraid to be different. Game on for the Mets! Hey Novak and others, I need some sort of snowfall predictions. It is right on our doorstep and need some numbers to know how much to dance. Bring it! Hopefully it's just me being gunshy (for obvious reasons,just look at the core metro's near misses all season) but I'm starting to get that old familiar bad feeling about the metro getting any significant snow...again. I hope I'm wrong, but.... Dr. Novak, what is the bust potential for the core metro? Give it to me straight; I can take it. I hope Novak is right, because it's starting to look like at least a quasi-bust in the core. I'm starting to hear a lot of chatter on tv of 2 possibly 3 inches. Last night I was hearing a lot of 5-7+ for the core. It's beginning to look like it's going to again be Wisconsin's storm. What a bummer season for snow in the core. We are a little island in the middle of a sea of locations north, south, east and west of us that have picked up at least their average snowfall to date. 4casters that panic & sway with each and every new model solutions are the ones that often look foolish in the long run. Don't panic. Don't solely look at model QPF. Look at the dynamics. This storm has all the ingredients necessary for a significant snow. Someone near or in the MSP metro will get 6"+, no doubt in my mind. As far as "they" are concerned, I can't speak for them. I have no clue why some outlets would only say 3" max. It doesn't make sense. I'm not saying that this can't happen because anything can happen when it comes to weather. However, I feel it is irresponsible at this juncture to downplay this storm. Storm is already busting for the core, was suppose to get 1-3” with the band this evening which is falling apart as we speak and moving off to the east and as stated by others a lull till tomorrow morning. Go low on this storm for the core. 3” max! well, here we go again. Just because downtown MPLS doesn't get 1"-2", that doesn't mean that it didn't happen. Listen, portions of the metro will get 1"-2" by 9pm. BTW, full disclosure. It is nerve racking seeing NOTHING on radar over the Plains & Midwest yet still anticipating a snowstorm to develop out of nowhere. However, you have to trust the dynamics, and that is what I will do until tomorrow noon & we are still skunked. You gotta love the folks on this site. Even AS IT'S SNOWING, they call it a bust. LOL. Don't believe your lyin eyes! Those aren't snowflakes coming down! Man, for a place where it never snows, we sure have gotten a lot of snow this week. those flakes amounted to less then 1/4" so far in the core west of Minneapolis and the 3" we got on Tuesday no one would consider "we sure have gotten a lot of snow this week". Please pay attention closely, forecast for the metro core tonight was for a quick hitting band of snow to last for an hour or two and drop 1-3" that obviously hasn't happened therefore we have busted so far, lets see what happens tomorrow. It is just painful watching this storm system struggle for moisture. If we don't see radar light-up soon over southern MN, then it is time to slam on the brakes. It is disheartening when guidance continues to paint a snowy picture, yet you know something is wrong. Once again, this is Mother Nature making us sit on the edge of our seats. She wants to make sure we realize that nothing is easy when it comes to weather. MSP airport = .4 inches of snow through midnight; Chanhassen just a trace 'for the books' yesterday. Looks like the main event is yet to come? I wish the cold temperatures would not be such a solid 'lock' ..... those seem to occur no matter what happens with the snow totals! Agreed, unfortunately. Here in the Maple Grove/Plymouth area the forecasted 1-3 inches didn't even result in a dusting. This morning my driveway was still bare. Will have to wait to see if today is a Total BUST as well. NWS has earned a grade of "F" so far for this system. Big disappointment. This system was advertised most of the week as being larger with higher accumulations and much longer duration of snow than Tuesday's system. Now we're just hoping to even come close to matching Tuesday's total of 4.5 inches in this neck of the woods. Good luck with getting 4 inches. Read the NWS discussion this morning. It sounds like maybe 2 inches for most of the metro. Very disappointed with the NWS and with this storm. Well, I better get ready for work now. As usual, there is nothing to see here (in the metro) folks. As my post yesterday alluded to the NWS has been off, warnings have changed back to advisories, snow last night was pretty much nil and now the totals for today are scaled back for the core metro to 2-5". At this rate as some have said above me Tuesday could be the bigger storm. Man I know weather is not an exact science but shouldn't it be a solid forecast inside 24 hours! Just saying! Just because it had the potential to BUST, doesn't mean that it will. The whole idea was that this storm was going to ramp up this morning & we would go from nothing to heavy snow in a heartbeat. That is happening now. Again, it is Mother Nature keeping us on the edge of our seats. The dynamics are there today, we just needed them to quickly come together. As far as snow totals are concerned, it is anyone's guess. I'm still thinking somewhere near 5" to 6" in the MSP metro, but this could be conservative if the storm continues to explode. Add that on top of the Coating to 2" that fell yesterday evening and you get a total of 6"-8". So now we get to find out who was right to either lower their totals or keep their totals the same (or even talk about "surprise totals"). Maybe 2 inches in South Minneapolis not far from the airport. Hardly any snow falling right now and radar doesn't look promising. 2 1/2" on the ground just west of the metro, and I think we got 1/2" last night. It's stacking up FAST too. If that gap in the radar doesn't slide in over us and it snows like this all day today, we're easily good for 6-7" today. Thinking schools might let out early this afternoon too. Be safe out there. Over 30 dBZ snow fall intensity in Rochester. Something tells me you don't know what you are talking about, or you are just trying to stir up a hornet's nest on this board. Pretty much everybody realizes that we are nowhere near done with the snow. That 1" you are talking about will likely fall with a 1/2 hour period later this morning. I don't see how another 2"-4" of snow doesn't fall between now & 6pm. Not hard to read/follow a radar Novak! Look at that pretty much linear line of heavy snow west of MSP, they will be the winners, it’s not moving east into the core of anything lifting north. That area of snow will pivot. If you were closely following radar at 3am this morning, you would've said no chance for snow today. Mr. Novak is right: NWS just slid the Winter Storm Warning west through the metro area!!!! Check out their page. Lovin' this dry air over MSP! Bring more of that! NWS has put Winter Storm Warning into the metro proper! Boom! NWS calls for an "additional 3-5"...so on top of the 3" we've gotten already. However, I do find it amusing that the main FGEN band of heavy snow set-up over Wright & Carver counties. Just outside the core metro and/or just close enough to tease the inner ring burbs once again. I would bet some areas out in Wright & Carver counties are already measuring near 6" of snow so far this AM. Meanwhile, MPLS & STP are still in the 2"-3" range. Perhaps there is a lid over the downtowns? Ha! Did the NWS issue the winter storm warning, then, for the entire metro because of the high winds/falling to -10 temps that are coming v. because of snow totals? Thanks! They upgraded because of the snow, 4-8" total forecast downtown now. Just love this! Bring it!!! I wonder of 'Busting Core' is bathing in the DRY skies he assured us of just a few hours ago. Thank God this character isn't a 4caster. He would have everyone out on the road right now still assuring them it is not snowing. Meanwhile, our 1/4 mi. visibility makes it obvious to the rest of the world that it actually is snowing outside. Getting hammered in north metro (east Anoka county) right now. NWS seems really strange to put out graphic saying 1-2” from noon to midnight. I’m getting inch and hour right now easy. Added a measured 1.5” in last 90 mins and it’s snoing heavier than ever right now. Thanks for the regular check ins Novak!! Just shy of 4.5" in Maple Grove and still coming down strong! Not the ~10 inches we got earlier in the week, but it's coming down steady in RW and causing chaos on the roads once again. For the last ten years or so I've always felt like Red Wing has been a hotspot for heavy snow totals. Seems like at least a couple of the storms MN area gets every winter drop the heaviest amounts around here; maybe it's just the bias of living here and paying attention to local amounts more than others, I'm not sure. Just off the very top of my head, they include the Domebuster, where I believe RW was in the top 3 with around 20 inches, that freak May storm a couple years ago that dropped 17 inches and crippled town for almost a week (still the craziest storm, winter or summer, I've ever experienced here) and earlier this week. Cool to see the radar "regenerate". Just when it looks like the system is going to fizzle over the west metro, it intensifies again! That must be the dynamics Novak is talking about with these past couple systems. The radar says one thing, but Mother Nature still wants to keep going. Huge props to Novak for sticking in there and nailing this one. Poor guy was weeping over his radar in the wee hours of the morning. Fail to the NWS for really missing this until they disccovered it was really snowing hard. After this week I think we can officially dismiss that it never snows in the Metro, that there is a dome over the metro, and the metro always is in the dry slot. Randomness of weather is quite remarkable. Exactly! Novak revised his totals downward on FB today... he could have stayed with his original map!!! It is/was right on. First, a big shout out to Novak for nailing this one!! I'm glad I listened to you. This is just one more reason why I stopped listening to KARE 11 a few years ago. I want accurate storm forecasts! Also, thank you for the updates through this storm, Novak. Second, as Stormgeek stated @3:02, this is what winter in Minnesota is supposed to be! As a snow junkie, I am rejoicing!! My property in Plymouth looks like a winter wonderland (FINALLY! LOL), and the snow has picked up in intensity in the past few minutes, as I watch in glee at the snow regenerating right over the core metro! Btw, a solid fresh 5 to 5.5 inches so far here in Plymouth to go along with our 4.5 inches from Tuesday! That is sad. :+( Sorry to hear it. Stay safe. Shoveling can definitely take a toll on the body. MPS wasted no time in cancelling school for tomorrow. It makes sense with the windchill combined with the streets still being in bad shape. My street is still glaze ice from Monday under all of the fresh snow. Per 7 p.m. NWS readings: MSP set record snowfall for this date: 5.7 inches and NWS at Chanhassen got 8.5 inches. Where is "Busting Core"? I highly doubt that we will see his face again. If he or she has any guts they will post snowfall amounts from the back yard. One thing about this business, if your a pro forecaster or a serious amateur, you have to admit failure when you bust, and be very modest to quiet with your successes. This winter just keeps getting better! We had two decent snowstorms within a couple days of each other and now the potential for a massive storm looks to be setting up early next week! Novak any thoughts on late Monday into Tuesday? Not that far out and the GFS is going nuts with totals. You are the hot forecaster now! I wouldn’t sleep on Sunday, before we get to Tuesday’s storm. 12Z NAM puts down some 2-4” in around the metro during the day! The next 7 to 9 days looks to be unbelievably active for winter storms. We have a chance for 2-4 inches of snow on Sunday, following a major storm on Tuesday. Then the Euro and now the GFS have another massive storm looking to form late next week. I just looked at Paul Huttner's Updraft blog which shows to two potential systems coming up. Is it just me, or are they eerily similar to the two systems we just had (Tuesday and Thursday)? Mets on Channel 4/11 in the metro are saying that in addition to the snow Sunday (a couple inches)..... Tuesday could bring another 4-5 inches, too. NEW THREAD for ANOTHER SNOWY WEEK IN FEBRUARY ... ?? Thanks, Bill. The blog was great this recent snow event. Your wish is my command. See new thread.